Hardangervidda is widely recognised as one of the best spots in the world for snowkiting. The Hardangervidda mountain plateau offers huge areas and stable wind conditions throughout the entire winter! You're going to love it! From January until the beginning of March; you'll get the best powder conditions and starting mid-March until May; you get longer days but soft spring snow. People often ask us if it's always windy? Our answer is No, but that's a good thing, and I'll tell you why. 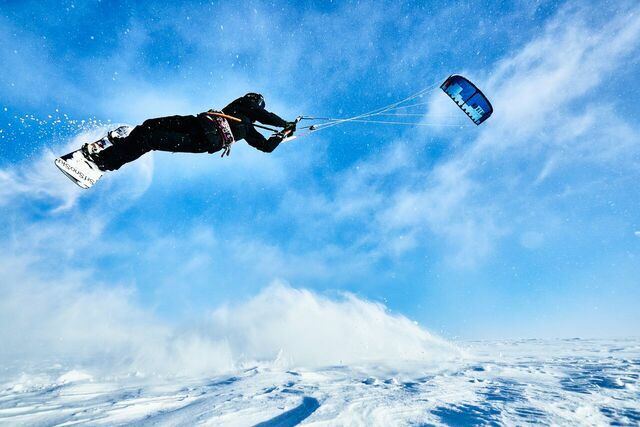 Snowkiting is different to kitesurfing in quite a few ways, but there is one crucial difference, and that is the fact that the surface you ride on changes quickly. The snow can be soft, slushy, powder or icy. If its always windy, the surface will still be hard and icy, and If its always snowing, the visibility will always be poor. To increase the chance of great snowkite days you want to be in a place where weather changes quickly and often. Haugastøl is located in the mountains between Norway's two biggest cities Oslo and Bergen. The location right between east and west puts us right on the border between two different weather systems. This gives us twice the chance of wind, sun, and good snow! The plateau is massive, and along the road – there is almost always one or more good places with the wind that day, leaving the rest of the plateau to rest and build up for exceptional conditions. You need a car to travel around to the different spots on the plateau to optimise your experience. You can also bet on catching a ride from other guests at Haugastøl Turistsenter if you´re travelling on a shoestring. You can reach the hotel by train from Oslo or Bergen. Get ready to be amazed and inspired! If you chose to stay at Haugastøl Turistsenter, you'd fast find out that this is not your ordinary mountain lodge. The Head chef Liv and her staff spread out an amazing buffet every night with a variety of delicious dishes; make sure you have enough space for dessert! Their food has become so popular, that some people travel up to Haugastøl just for that. The kitchen has its own Instagram account as well, click here to check it out! Drinks in the cosy bar at Haugastøl after a long day out is a great way to end the day. Make sure you try their own locally brewed beer. Ask Bjørn for any beer recommendations; he´s tried them all! If you´re up for a party – just a short train ride away; you can hit the clubs in Geilo. If sitting by the fireplace, relaxing in the sauna or catching up on Netflix is not your thing there is plenty of other great outdoor activities. You can cross-country ski or head to Geilo ski resort to hitting the slopes. At Haguastøl Turistsenter you can rent bikes or snowshoes as well. If you plan, ice driving with fast cars or dogsledding is also a great option. If you are in the mood to see something scenic one of the worlds most spectacular waterfalls, Vøringsfossen is located only 40min drive from Haugastøl and continue for another 20 minutes, and you are at sea level in the fjords. Yes! All of Norway is covered with 4G for roaming, and all hotels have wifi. Haugastøl Turistsenter is by far the best option for accommodation. This family-run hotel is filled with fellow kiters from all over the world all season long and is located right on the edge of Hardangervidda. The hotel is the home of Red Bull Ragnarok each year, and several familiar kite profiles check in here every season. On stormy days the road over the mountain can close due to to much snow and poor visibility. During these days they offer snowmobile shuttles to spots with better conditions for guests in the hotel. Thirty minutes further east, you have the small town of Geilo also offers several accommodation options, ranging from hotels to cabin rentals. Camilla has been kiting and working on Hardangervidda for the past 15 years. She has participated in the Red Bull Ragnarok 8 times, and had podium placements in all of them. In addition she has kited across the Greenland icecap three times. She is owner of KITEKURS.NO , provider of snowkitecourses, guided tours and expeditions. Camilla is also an avid kitesurfer, living in Tarifa in the summer months and ... she crossed the Atlantic Ocean with a kite as well. You´ll be in good hands! Been to Hardangervidda? What did you think? Where are the Best Kitesurfing Beaches in Hardangervidda? The biggest benefit of Hardangervidda is the almost unlimited amount of different snowkite spots. Hardangervidda Nationalpark has 3 422 km2 ridable terrain, and Hallingskarvet Nationalpark has 450km2. The National Tourist Route Hardangervidda starts right outside the hotel and passes through the heart of the national park. This gives us 38km of the road where you can stop anywhere (there is parking) and snowkite. Being flexible to move around the best spot of the day will greatly improve your chances of epic snowkite days during your holiday. If you want to follow the wind, there is also an app with live camera and wind updates from all over the plateau. You can download “Haugastøl Wind Meter” for both Android and Apple. When is the Best Time to go Kitesurfing in Hardangervidda?